Tcl is the oldest scripting language that we teach - but there's nothing wrong with a bit of age. It's very much a command based engineer's language, designed for integration into applications written in C, and used in various big systems / products in the Numerical Control and Integrated Circuit and chip and logic design worlds. The Tk Graphic User Interface adds to Tcl scripts the ability to produce user interaction windows and graphics, and the Expect extension allows programmers to automate the control of other programs which were designed for human, keyboard to screen use. • A 5 day Learning to Program in Tcl course. No prior programming knowledge is assumed, and after a first day where we look at the principles of how to program (viewed particularly from the Tcl aspect), we combine the course with "Tcl Programming" which is also a course that gives you plenty of time to learn. • A 4 day public course on Tcl programming. 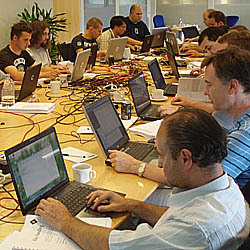 This is more gently paced than most of our programming courses, as many of Tcl our delegates are quite new to the world of computer programming. However, a little prior programming experience is assumed. The course includes some coverage of the Expect extension to Tcl, and the Tk Toolkit and is suitable for delegates who will be making use of those extension as well as those who will not; an extra session on the Thursday evening will cover more Tk and Expect detail if required, and an extra practical session too. • A 2 day public course on the tk extension (wish). This course is for delegates new to us with good prior Tcl knowledge who wish to add the Tk graphic user interface to their skill set. Note that much of the material is included in our current Tcl course, so if you're attending that course it's unlikely that you'll want the Tk course too. If you've a group of three or more delegates who wish to learn about Tcl at the same time, a Specially Run Courses course can be arranged, and for larger groups we can also run a Private Courses course at your offices. Such courses are tailored to meet your requirements - please contact us to discuss the detail of what you need. We use Expect on this live web site on pages such as our server availability test where we want to parallel ping a block of hosts. And we use Tcl/Tk on similar internal scripts - they're vital to us in that when we set up on site, a single test from one machine can check out our whole network! Tcl and Tk were written by John Ousterhout the best part of 30 years ago and have had a chequered support history. But they're pretty stable, useful, and these days are Open Source with a good community around them.